The import label Gladyson releases a 2CD set with first takes recorded during the 1960s and 70s. We’d like to present to you a collection containing Elvis’ first takes, recorded throughout the 60's and 70's. We at Gladyson consider these first takes to be on par and sometimes even better than the master recordings. Elvis in the studio did some magnificent first takes, but as sessions tend to go, the songs keep evolving, and everything gets perfected, but some of the magic seems to dissapear with each passing take. We have chosen the best first takes and collected them in this 40 track housed in a beautiful 6 panel double disc digi-pack, which we hope you enjoy. We have left some dialogue in where fitting, and are pleased with the results. 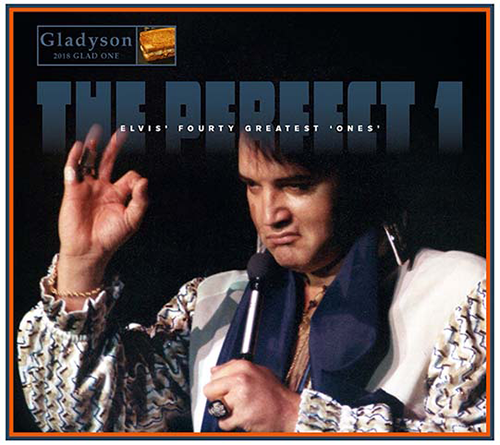 Instead of listening to the masters, get out of your shell, put this disc into your player, and enjoy ''The Perfect 1''. More redundant rip off scams. Take FTD's past work and repackage the music with new artwork and wait for the "suckers" to come and take their hard earned money. I'm surprised FTD hasn't gone after these "clowns" like a lot of others. Sad. I've been searching in my personal music programme in my computer. I've found 50% of the songs on several FTD CD's. Every first take is already released on FTDs.